MAGGIE: Hi Katie, it's Maggie. From the Tiniest Tiger's Conservation Cub Club? KATIE: Sorry, I gave at the office. KATIE: Oh, MAGGIE! I'm sorry...you know those pesky cup & string marketers. Is everything ok, Maggie? MAGGIE: Well Katie, to be perfectly honest...no. It's Annie. You know, the kitten. KATIE: Ahhhh, the KITTEN. Say no more. I know exactly what you're going through. MAGGIE: *sigh of relief* Oh, Katie. I just knew you'd understand. What with Waffles the orange...what do you call him? MAGGIE: Yeah. What am I gonna do??? KATIE: Is she stealing your food? KATIE: Is she stealing your toys? KATIE: Your cat tower? Your scratching post? Your limelight? KATIE: Tell me Maggie, is she doing the SOS Stretch? The show-off-snake stretch? KATIE: Uh oh. I've seen this before. This is serious. 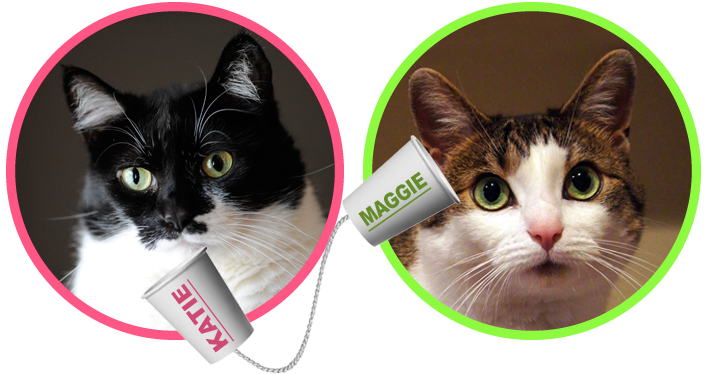 ⚫ Want the inside scoop on Katie & Maggie's therapy session? ⚫ Want to know the secrets of living with a crazed kitten? ⚫ Want to enter a COOL giveaway sponsored by GLOGIRLY & The Tiniest Tiger? 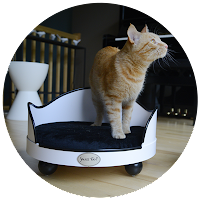 Visit The Tiniest Tiger to learn Katie's tips and tricks and earn another chance at our Stress Stopping Giveaway. TWO winners! We'll be drawing one lucky winner from GLOGIRLY and another lucky winner from The Tiniest Tiger. 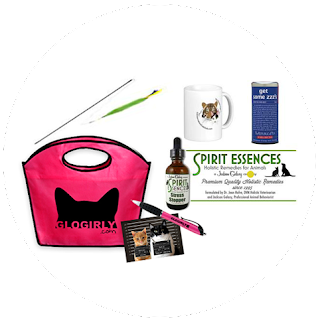 Each Winner will receive an exclusive prize package including: Pink GLOGIRLY Tote & Pen, Waffles & Katie's Mugshot Postcard (frameable), Jackson Galaxy's Spirit Essences Stress Stopper, Wand Toy, The Tiniest Tiger Mug & Get Some ZZZ's tea from The Republic of Tea. Leave a comment here on GLOGIRLY telling us who in your house needs a little Stress Stopper. Visit The Tiniest Tiger and leave a comment there too. Hint: Better pay attention though because there just might be a quiz. ha! The contest will end on September 13, 2013. Please one comment per person. We will enter all names into Randomizer.com. The winner will be notified by email or through Facebook depending on the contact information you provide on The Tiniest Tiger. If you connect through Facebook, check your other messages, not just your main messages. Make sure you are watching for an email from us. The subject line will say Stress Relief Giveaway Winner. Giveaway open worldwide. Void where prohibited by law. KATIE: Waffles. You can't live with him. And you can't live with him. And if you just can't wait...Save 20% thru the end of September with coupon code: Glogirly. i think i'll be happy just winner that cute postcard! Oh no! stealing food and toys ranks very high on the stress meter!!! I would say the male person does. He is surrounded by cats and goats and chickens. My poor torbie Grit needs it! She is surrounded by 3 boys who don't show her the respect she deserves. She spends all her time trying to whip them into shape and only the smallest one ever listens! Our Bernie could use some stress relief. He is a teenager and has lived with us for one year. He is still very skittish and will only come be on our laps if another cat is on our lap. He needs the reassurance of a wing-man! My son's 2 new kittens ~ Pixel & Bit ~ could most certainly use some. Other than me that is! Thanks for the chance! The Stress Stopper is part of the concoction my human puts together when I have to go to the vet! I don't even want to THINK about... ugh!... kittens! Meadow (or rather Miss Misty Meadow) needs a little stress relief. Although our kittens are now 5 years old they just love to attack the senior (13 yr) girl. Vashti, our Siamese, needs stress relief. She was a mighty warrior who is now scared of her shadow! She was once Queen of Purring Pines but she let Jonah usurp her position 2 yrs. ago, even though they're both 7 now! Poor Maggie. Sounds like her trouble is just beginning! Stress can be so stressful. The cat in our house that needs some Stress Stop is Thomas O'Toole. He got so stressed once he licked his bottom bald. When did she get a kitten? Wait, when did she fall off of our blog reader list? *sigh* One day, we will find all of the blogs that we lost in the gap transferring off of Reader. This was a very good reminder! We've heard the head peep talking about spirit essences to try to bring Ashton out a bit more. This could be helpful! I'd say my tuxedo diva, Ryder, could use a little Stress Stopper! She is always upset about something. She wants the catnip to herself. She wants the 6 ft tall cat tree to herself. If the other cats get involved with her , she has such a TiFF!! Typical female tuxedo snob! Ut oh Maggie has some big problems. We think Allie could use the stress stop because she gets teased by Raz a lot. Katie, I think we need that stress relief kit here. We adopted a new, younger cat (sound familiar?) a few months ago and one of my older girls is not happy with this new girl. The new girl has deformed back legs, but that doesn't stop her from giving the older cat a hard time, this girl can even jump, right on top of the other cat too! Maybe the stress relief kit will finally bring some peace and quiet to the house! Especially in the middle of the night when new cat decides to start in fight in the bedroom! Thunder needs help. Maggie, aka Dumb Dog, is always in the way--demanding my time--and she smells--like a dog. We've got a Waffles also, only his name is Harry. He loves to annoy our 14 yr old Sophie who just wants to be left alone! Boy, do we need this! Clancy (also a ginger terror) plagues poor Cupcake to no end! As you know I have my own Waffles named Tubby. So much energy he has. He is relentless to the other cats when he plays. Do you have any calm the heck down stuff? LOL. The one who needs stress stopper the most would be Garfield. So nice you helped out Maggie. Thanks for the great contest. i wish i can use it at Mom. haha! since i'm the only kitty in the house, for sure Mom's gonna use it at me. I am the one who needs the stress stop. One of my animals need it too. My dog and cat do not get along and my Reese's (the cat), is constantly meowing to try to make the dog mad. Then the dog tries to be in my skin because she thinks the cat is trying to steal the attention she thinks she should have. Faythe, out very petite lady cat, is the only lady among four grown-up man cats who are two or three times her size. Her strategy is to growl and hiss at the barest glimmpse of any of the others, which works to some extent because they all think she's insane (you can see it in their eyes) and mostly leave her alone, but sometimes they just need to, (whisper) touch her (/whisper). She could definitely use some Stress Stopper. Now i'm REALLY happy I kicked that cute kitten Isabel out before the peeps got all into her. This is quite concerning! Sure, I'm the newbie here, but what if we add to the family?? I'm the princess here! And I must remain so! Just letting you know I can relate. As to who needs stress relief... and since Zim and I aren't cats... Mom's birding buddy recently adopted a 2-year old black cat named Puck. 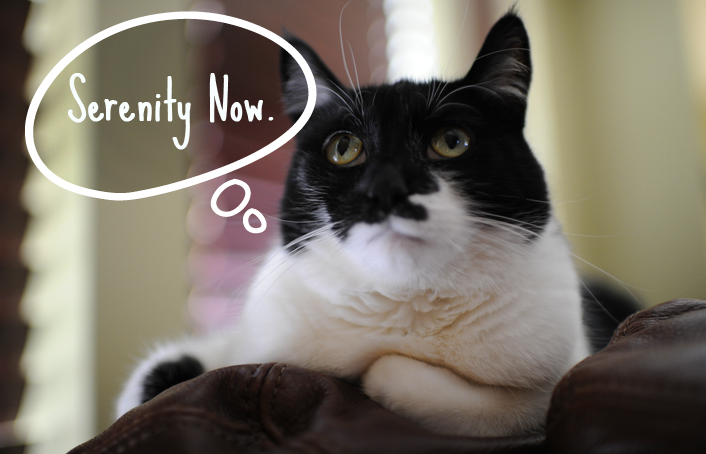 From what we understand, her other kit-cat Roo could use some de-stressing! If we won the drawing, I think we'd turn our winnings over to Roo. You're very wise, Katie. I mean for a cat and all. Do you have a recommended vendor for the Spirit Essences? We won't enter this time because we got you bag with super stuff in it already. Katie we all need some stress free time from Ping our orange menace! We will be having some, erm, house guests, soon. So we think that stress stopper might just come in handy! My cat Boogie could sure use a little stress relief. Ever since her brother Ozzie passed away, she has been a bit nervous. She had some problems with peeing out of the litterbox for a while, but we worked with things and seemed to resolve the problem. However, she is still a bit nervous with the other cats now. Catnip and Feliway have helped, but we are always looking for good solutions to help her live a more peaceful, stress free life. Thanks! The momsy is a bit stressed, and WE are stressed because she keeps putting this goop in our ears! …. so what I am saying is I NEED THE STRESS STOPPER THINGY STUFF! Me and Sasha need your advice too, even though Saku has been here for five years. Skootch needs the stress stopper because of his younger kitteh brothers. He insists they are not related to him in ANY WAY. He has all of the same complaints as Maggie, especially with the stretch snake ploy - both Wilbur and Louie use it on him. They figure that Mom thinks it's cute, but Skootch knows better - it's bare-faced KITTEH AGRESSION!! 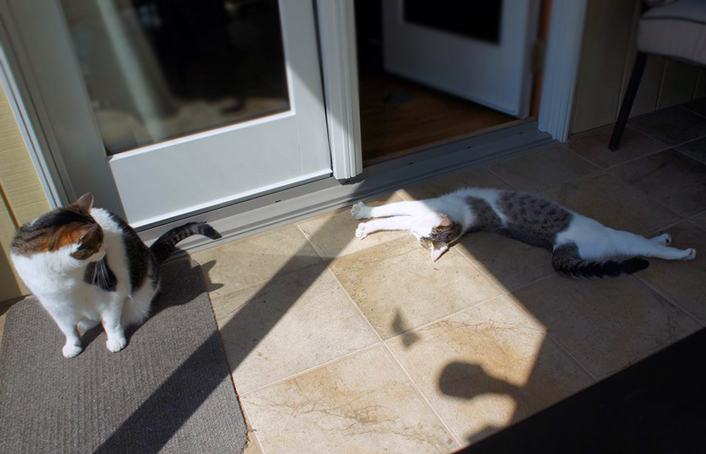 I´m sooooo glad that I´m the only cat in my house !! I feel your pain. I rescued a 5 month old kitten from along a country road on August 3rd and have been busy introducing him to my 2 year old boy, Enzo. Teenagers sure are rowdy! Enzo could use a little stress relief now and then. Jake needs a Stress Stopper in our house lol! The one in need of a stress stopper around here (besides me) is poor Leonardo who feels (and has expressed) that the introduction of Mikey into his cat life has not on the whole been welcome. Things are calming down a little bit but he still expresses this with certain inappropriate peeing actions in spite of there being 3 litter boxes. The Feliway helps but I don't have a diffuser (just spray) - I should buy one. Duncan Idaho could use a stress break as he's so shy! I'd like him to come out of his hidey hole more often. I think all mewz advice is purrfect Katie- I also have a beastie boy brother who I MUST tolerate no matter how hard it is. I will try mewz ideas on him, thank mew! Mickey Mouser needs a little help in this department. He gets along fine with Tommie, but any little noise has him heading under the bed. My female cat Michelle needs the stress stopper. We were fostering a feral mother and babies, we managed to get the babies all adopted to loving home and we have decided to keep the mother. Michelle isn't terribly mean to the mother cat but definitely could use the stress stopper to help her adjust to the new addition. The mother cat could use it too since she isn't too used to humans yet, she is really enjoying the indoors though! My Russian Blue, Liaden DEFINITELY needs some Stress Stopper to deal with her trouble-making brother. I wish there also was one made for frazzled furmommies like me. i dont have cats, but my middle child, tressa, who is 4, gets so stressed out when i try to ckip her nails. she goes bezerk. it takes 2-3 people and stress drops.